Yeah, but: Smaller and simpler. 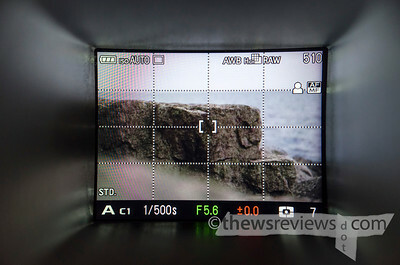 The Long Version: LCD viewfinders are designed to work around usability problems that shouldn't really exist in the first place, so I suppose it was inevitable that one would find a home on my Sigma DP3 Merrill. While I'm happy enough with a bulky and complex tripod-mount one on my big SLR, a compact camera needs something smaller and simpler. After considering a number of options, including some very expensive ones, I picked up the Kinotehnik LCDVF. The LCDVF – please don't make me type the company name again – is about as simple as it gets. The shell is one piece, without any hinges or diopter adjustment doohickery, with a two-element lens and a rubber eyecup that can be removed and repositioned for left-eyed people. 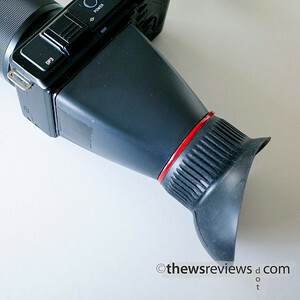 The viewfinder attaches with magnets to a metal frame that adheres to the camera. It's secure enough that I can pick up and carry the 1-pound camera from the viewfinder; this isn't wise, but it's possible. The package includes two of these metal frames, which gives the option to use the one viewfinder on two cameras, or provides insurance against adhesive mishaps. The metal frame and magnets makes for a streamlined and lightweight attachment method that's perfect for a little camera, and weighs far less than attaching via a tripod-ready plate. It almost verges on elegant, but mine has just a little bit of side-to-side wobble that I've fixed by shimming the hood with a single thickness of gaffer tape. The LCDVF has a 2x magnification ratio, and to be honest I can't really see the difference between it and a 3x view. The resulting image is large and clear; the 28mm-e lens that I used to take the above photo doesn't do it justice. The inside of the hood really is that shiny, though. I've never noticed it as a problem when I'm actually taking photos, but it is really shiny. Of course not every camera needs the assistance of this kind of viewfinder; I'd never consider attaching it to my Ricoh GR, for example. But having the LCDVF on the DP3M really does improve my stability with this long-lensed camera; I'd rate its as being just a bit less of an improvement than a lightweight monopod. While I was mostly hoping that the LCDVF would help me see the DP3M's screen, now that I know what it can do I wouldn't hesitate to put one on any LCD-based camera that usually uses a long lens. I bought the LCDVF because the Kamerar QV1 (right) added too much bulk, weight, and complexity to a little camera like the Sigma DP3M. 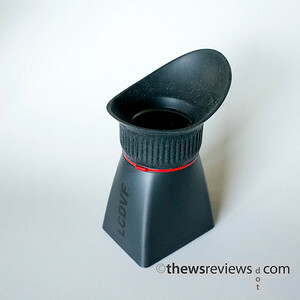 While Kamerar does have smaller viewfinders, the slickness and simplicity of the LCDVF is hard to beat. But simplicity may be only skin-deep with the LCDVF. 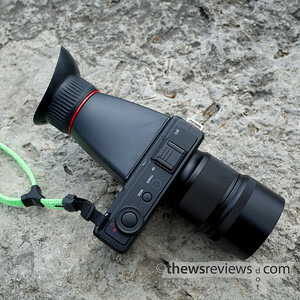 It has a double-element lens that's noticeably thicker than the one in my Kamerar or Hoodman loupes, and Kinotehnik says that it won't risk concentrating sunlight and burning the LCD the way other designs can. I haven't felt the need to test this myself. 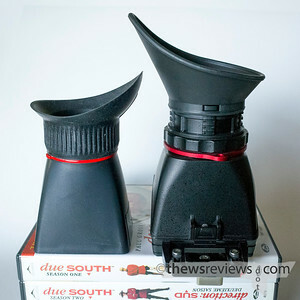 In a fairly short time period I went from owning just the Hoodman Hoodloupe – and never using it – to having two different magnifying loupes to suit two different cameras. That's probably excessive, but it suits each individual machine and I don't see a lot of overlap. If I had to choose only one, it would be the LCDVF, and I'd just have to put up with having the magnetic frame tapeglued to the back of the D800 during the 95% of the time that I don't use an LCD hood on that camera. 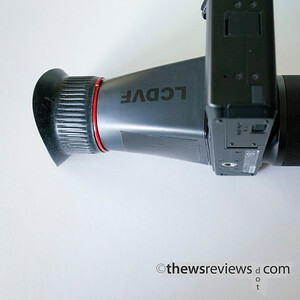 The LCDVF and Sigma DP3M is such a natural combination that I prefer to use it whenever the little Foveon camera isn't on a tripod – which is the opposite of how I use my SLR with its bigger LCD loupe. Life can be funny like that.